8 days old. Right before he peed on me. Getting the epidural was worth it. 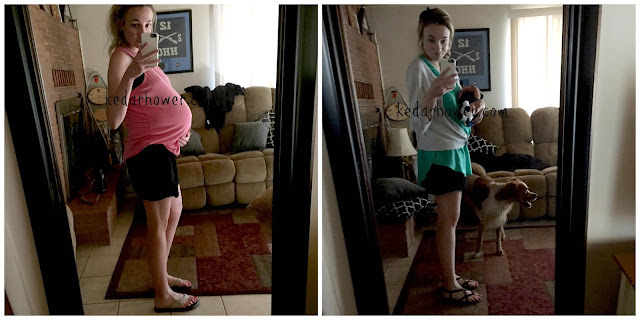 I was initially very hesitant to get an epidural. I didn’t want natural labor. I just know that recovery time is often cut down when you don’t get an epidural. Plus, everyone has epidural horror stories. (Can we STOP sharing our labor/epidural horror stories with pregnant women? It does no good for anyone.) Because I did get it, I was pretty much bedridden for the most of the day, after actually having the baby around 11am. I also really was grossed out by the idea of a catheter and didn’t want the epidural for that reason alone. Like most things with this experience, that wasn't anything to worry about. However, showing up at the hospital with water already broken and at 4+ cm meant that it was my call on when I wanted it or if I wanted to go as long as I could without it. I made it about two hours, and my Dunder Mifflin stressball got quite a workout. The contractions got so close together that it wasn’t worth NOT having it if I was planning on going with medicine anyway. The reason I held off was because I didn't want to be stuck for 20+ hours in the same position if it was going to drag on for awhile. For the next 6 hours, I felt nothing. I went from 5 cm to 9cm in less than two hours and I just sat there and watched the so-called “contractions” on the monitor. An epidural can make you really sick. This was the not awesome part about heavy pain medicine. I was very nauseated from the epidural. It felt like carsickness and I couldn’t make it go away. They gave me Zofran but that did nothing. This meant that I was, indeed, throwing up in between pushes. When they found that I was dilated to 10 cm about five hours after getting to the hospital, they told me I could start pushing and set everything up for it just to see if he was ready. He wasn’t quite low enough so, instead of pushing for 2 hours, they opted to just let me sleep and contract him down because I couldn't feel it anyway. Eventually, I felt so sick from the pain medicine that I called the nurse back in and was like “let’s just do this, please”. I pushed for about 45 minutes and he was born. A hospital can make you not want to breastfeed. (Apparently) I missed the memo that said I had to breastfeed my baby in order to take him home from the hospital. This will require a post of its own because I haven’t been this upset about something in a very long time. The nurses more or less labeled this poor baby as “failure to thrive” simply because he wasn’t 100% latched by 24 hours old. So we didn’t get to go home at the 24 hour mark and ended up in the hospital for 2 1/2 days. Pilates and Yoga are a great pre-cursor to labor. I did both almost every day of the last 9 months. Sometimes one, sometimes both, and I missed a few days, but I at least tried to stretch out in a puppy dog pose once a day, if nothing else was getting done on the mat. When you have an epidural, you can’t feel to push. They say you should feel something but I honestly didn’t, so I just had to listen to what they told me to do. Therefore, using core muscles you can’t feel takes a bit of effort. They kept warning me that I’d need to “rest up” before pushing and I realized, maybe too late, that I’d never thought about that. I hadn’t eaten in 12 hours and I hadn’t slept either, so energy I had little of. I feel like all the mat work really helped me out there because it wasn’t as impossible as I initially thought it would be. I mean, I can 100% tell you that I barely thought about what labor would be like until we got down to that last week or so when I started having contractions. I hadn’t exactly been practicing my breathing exercises and I never took an actual class on it. We got really lucky here. Anyway, in lieu of a birth story, this is pretty much it. Pre-labor started over a week before he arrived so the contractions and pain were beginning to wear me down anyway. Scott had been in Denver for the day and arrived home about 4 hours before my water broke at 1:30am, so we got lucky there too. My "goal" on Monday, July 9th was to get to the library to sign up for a library card and to get a pedicure and I'm really glad I took care of those things because Wells was here less than 12 hours later.